Brian Setzer is best known as the wild front man/guitarist for the band "Stray Cats" and more recently "The Brian Setzer Orchestra". Over the last 20 years he has continued to keep Rockabilly alive while maintaining the same energy that is essential within this style of music. Rockabilly is a melting pot of several different types of music. The most obvious will be rock, country, and swing. From there you can go deeper into the roots of blues, jazz, etc. The Stray Cats were formed in the early eighties. They were a 3-piece band that flat out rocked. I remember being a kid, way before MTV, CMT , and VH1. I'd stay up at night watching a special HBO hosted, called "HBO Jukebox". They always played "Stray Cat Strut" and a few other good videos. As other styles of music came and went, Brian Setzer seemed to be one of a few that has survived doing exactly what he did in his earlier days. Point being, the main thing that makes this music cool, fun to play, and allows it to last, can't be taught. It's all about attitude, having fun, swingin' and pushing the limits. Rusty: We'll start by talking a little about Brian's tone. Brian uses a signature series Gretcsh through a Tone Master, one of Fender's custom shop amps. He uses some old stomp box effects for delay etc. For this lesson and all of the other ones I teach, I've used the same G&L ASAT Classic through a compressor. From there I've plugged into a JD Morley preamp that gives me the amp emulation and distortion. Rusty: The big difference between my tone and Brian's will be that he uses an archtop guitar while I use a solidbody. Listen to his music and after awhile you can hear the difference between the two guitars. I'll have to break this lesson up into two segments because of it's length and variations. The whole song has 4 different parts. Rusty: We will use a variation of the same turnaround throughout the whole song. Rusty: Hopefully video will clear up any questions concerning which fingers I use. There are several ways you could play this lick and even change it. Notice I hold the chords while playing the melody licks around that position. All we are doing is emphasizing the dominant (b7) voicing while picking a 1 - 5 bass line typical of the country "Travis Picking or Chet Atkins Style". Rusty: Look at the second video that was slowed down. There, I use a pick which is probably how you'll want to play with this song. For the alternating bass I use the pick or if you stick to your fingers use your thumb. 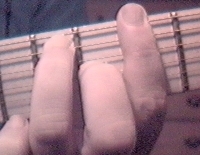 Rusty: On the higher melody licks I alternate between the middle and third finger. If you use your thumb you could use your index and middle finger. I keep that same pattern throughout the whole lick. What throws you off is the triplet inside the lick. But if you'll stick to one of those formulas you should get it. Rusty: Before we cover another part let's look at the E minor blues scale. I use this scale a lot over the licks. Rusty: Here is the E relative minor in that position. Rusty: When we combine the two together we have a combination of 8 notes. We'll use these two scales throughout the song. PART 2 is based off of a diminished voicing that come from the E minor blues scale. Rusty: PART 2 is a break that plays the diminished chord 4 times. As a lick we play an arpeggio that goes along with it. Rusty: This does a lot for this section. I'm using it in an aural sense. I'm letting you know I'm about to take off and jam over the first time through. I use it again the second time which does the totally opposite by breaking down into something totally different. Also on the second time through I have two other guitars harmonizing. That is done intentionally because the whole idea comes from a horn section, where you might have several people playing. We'll cover more about diminished chords and where to use them because Brian adds them in all through his playing. Rusty: I'm sending you the turnaround tab for variation 2. Rusty: Here's a video that goes through the whole chord progression and the tabbed out turnaround. You'll use the same "boogie rhythm" for the rest of the song. This will be the part that we will build our solo licks over. For the licks I've mainly use the blues scale and I threw in some country stuff but we'll break them up individually. 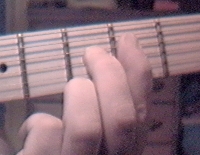 Rusty: Lick 1 - Is an open string blues lick that repeats for the first 8 bars. You'll want to play these licks with a loose feeling. Most of this lick is up and down strokes with the pick. Don't worry about extra noise from other strings. Just dig in and play hard. 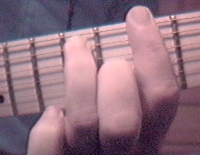 You might want to hybrid pick the open note on the second string - meaning use your middle finger to grab that note. Rusty: Lick 1a - The turnaround lick is built off of the blues scale and it highlights the diminished chords used over the last bar. 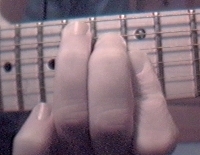 Rusty: Lick 2 - Follows the same idea as lick 1 but has a major quality because I'm playing the major 3rd at the 16th fret. We start by sliding in from two frets back at the 10th fret. This helps emphasize the b7 of E which is D giving our lick a dominant sound. Rusty: Lick 2a on the turnaround we use the second variation. Our lick follows the chord changes using a common double stop lick that can be found in rock, country, and blues. 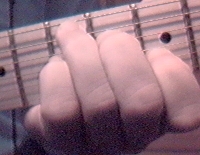 This lick also emphasizes the dominant quality of the chords. The last bar uses the diminished idea at the 15th fret while our rhythm resolves on the V chord (B). Just to show you that those two can work together. Rusty: Rhythm 4 is something "off the wall" that I thought sounded cool. It breaks the song down using some different ideas based over the key of E. The progression is different and is really has more of a Ragtime quality than anything. Although I didn't play it this way, by fingerpicking you could put the two parts together. The 3rd guitar is something that is supposed to be like a violin in the background. It's something to raise the eyebrows so people can ask "what is that?" Rusty: Over this lick we're highlight the (b7) again for each chord. What makes this different sounding is the backing chords. When we get to the D#dimb7, we play the same lick that will work over the A7 and it may be easier if you look at that lick built of the A7. The last part has a swing lick in E. That lick could stand alone as an ending. Within in it you have a diminished arpeggio leading in to some chromatic notes that bounce into the major 7 of E. You could think of it as a bebop lick. Rusty: We're still playing over the same progression except over the E instead of emphasizing the dominant 7 like in lick 1, we play a minor lick adding in the major 7 (Eb) as a passing tone. That idea will come into play in later lessons when we look at some minor chord progressions and use the harmonic minor scale. The rest of the lick is like the first one except we just hang it out there where the surf lick begins. Lesson 2 will be a continuation of this lesson.